GBPUSD has lost moire than 50 pips after slightly weak UK jobs data. The pair hits intraday high of 1.29343 and declined till 1.29083 at the time of writing . It is currently trading around 1.29300. UK Claimant count came at 14.2K compared forecast of 12.3K while Unemployment rate at four decade low of 4.0% and UK wage excluding bonus rose 3.4% in three months to Dec compared to forecast of 3.5%. On the lower side near term support is around 1.2890 (200- H MA) and any violation below targets 1.2850/1.2820.The pair should break below 1.2770 for further weakness. 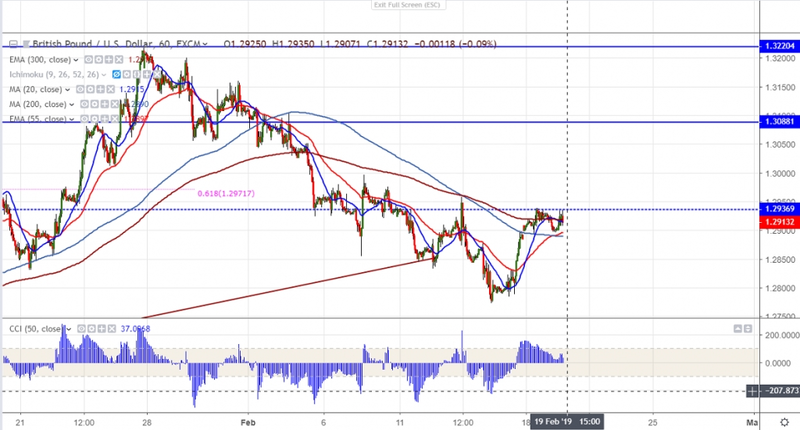 The near term major resistance is at 1.2960 and any break above will take the pair to next level till 1.3000/1.3045. It is good to buy on dips around 1.2875 with SL around 1.2820 for the TP of 1.3000.